Bach composed his keyboard partitas in Leipzig between 1726 and 1731. Entitled Clavier-Übung [Clavichord Practice], his Op. 1, they were the first pieces that the composer published himself. The title should not mislead one into thinking these are student works, but rather points to the pedagogical aim that is always present in Bach’s work. The complete title provides a fuller association of pleasure and instruction: “Clavier-Übung bestehend in Präludien, Allemanden, Couranten, Sarabanden, Giguen, Menuetten und anderen Galanterien; Denen Liebhabern zur Gemüths Ergötzung verfertiget von Johann Sebastian Bach” (“Clavichord exercise consisting of Preludes, Allemandes, Courantes, Sarabandes, Gigues, Minuets and other Gallantries, composed for the pleasurable diversion of music lovers by Johann Sebastian Bach”). The pieces’ gallant character emerges from their roots as dances. Some of these genres, such as the allemande, were no longer danced in Bach’s time, but Bach preserves the character of each as well as a sense of their original steps. The Minuet, for example, is built on a series of six rapid little steps (to be shared with a companion; this is indeed a very gallant dance). The interpreter should emphasize this six-step figure and thus make a longer musical phrase built on a minimum of two measures. The gavotte, for example, is based on two quick steps and one long one – the dancer gets to the long step with a little jump, just before landing on both feet. As with the Gigue, the feel of this dance is lively and energetic. It is amusing to note that in the Sixth Partita (BWV 830), the Gavotte (Tempo di Gavotta) combines rhythmic elements from both the gavotte and the gigue dances. Listeners may be confused as to whether they are hearing a gavotte or a gigue, and whether they are approaching the end of the partita, since the gavotte was traditionally the final movement. Bach was a master of ambiguity and wit in his compositions, and supported the idea of humour in music. Written around the same time as the St Matthew Passion (BWV 244), the partitas are divided into movements that can be light and graceful, and those that are highly intricate, built on complex counterpoint – like the Sixth Partita’s Toccata and Gigue movements, or the Second Partita’s opening Sinfonia. Performance of Bach’s music on the piano inevitably raises the issue of pedal use. Pianists who play Bach nowadays seem to be divided into those who use the pedal and those who do not, preferring a dry sonority. Perhaps the latter seek to imitate the sound of a harpsichord. But Bach, of course, also played the organ. Therefore, my approach is grounded in the belief that his music goes far beyond any given aesthetic prototype which seeks to limit it. I believe that these partitas were not written to call forth a specific sound but rather elicit a vocal approach that can come from various types of instruments (winds, strings, or keyboards). The musician should emphasise the piece’s musical structure, the connections between the voices, and the expressivity of the musical line. Use of the pedal in playing Bach is a very sensitive subject. My belief is that the pianist must use it as judiciously as possible, in order to maintain transparency, clarity, and tension among the voices. Too much pedal blurs the sonorities, and I believe that this goes against the spirit of the music. The power of Bach’s music arises from the interplay between different elements: the rigour of the structure and the vigour of the rhythm (related to a beating heart and thus a metaphor for the inevitabilities of life), along with the unforgettable melodies that conquer the listener’s mind through their beauty. I believe that the music of Bach requires, therefore, a vocally-inspired interpretation. Just as singers use and vibrate their vocal chords, so should pianists let the strings of the piano vibrate, which in practical terms means using the pedal. The pianist’s main preoccupation when playing Bach on a modern piano should be to find the right balance between allowing the strings to sing in freedom and restraining them. Bach has a quiet sense of humour, but it is present in his pieces. I thought he might appreciate, wherever he is, the little multilingual word game I’m playing in this recording’s title. 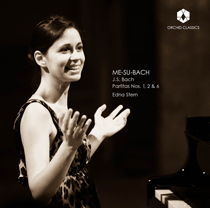 In Hebrew, Mesubach means “complicated” – a fitting description, surely, of Bach’s music. Edna Stern began her studies in Israel with Viktor Derevianko, a student of Heinrich Neuhaus. She continued studying with Krystian Zimerman at the Basel Hochschule and with Leon Fleisher at the Peabody Institute and at the Lake Como International Piano Foundation. Her repertoire ranges from Bach to Berio. 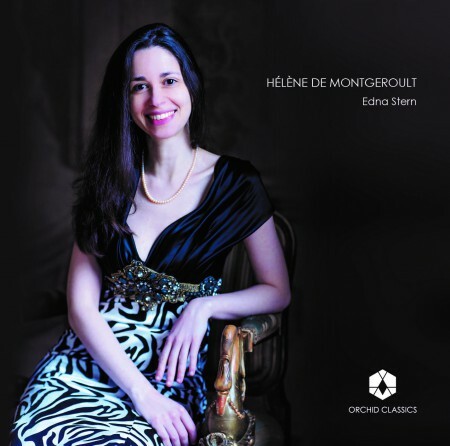 Her recordings are highly praised by critics, receiving such awards as the Diapason d’Or, Diapason Découverte, Arte Best CD, Gramophone’s Upcoming Artist, and the Sélection Le Monde of best classical CDs for 2010 (Mozart Concerti/Zig-Zag Territoires) and 2014 (Beethoven Sonatas/Luna). She has performed at prestigious halls and festivals such as the Olympia in Paris, the Roque d’Anthéron Festival, the Concertgebouw of Amsterdam, Munich’s Hekulessaal, the Colmar International Festival, Paris’ Châtelet Theater, Moscow’s Music-House, Petronas in Kuala Lumpur, and Musashino Hall in Tokyo; she has performed in solo recitals and with orchestras, with conductors such as Claus Peter Flor and Andris Nelsons. Stern gives masterclasses all over the world, including at the CNSM in Paris, Rutgers University, and the Tel-Aviv University’s Zubin Mehta School of Music. She has been a professor at the Royal College of London since 2009 and is the artist in residence at the Théâtre Impérial of Compiègne. The Imperial Theatre of Compiègne, a jewel of architecture, was built on the request of Napoléon III in 1867 for the purpose of entertaining his court but was inaugurated only in 1991. It is situated just an hour away from Paris and is an extraordinary venue for music, thanks to its outstanding acoustical qualities. Conductor Carlo Maria Giulini considered the hall “as one of the most perfect in the world, and even superior to the Musikverein of Vienna,” known as the standard for concert halls. The only musical and lyrical venue between Paris and Lille, the Imperial Theatre, under the artistic direction of Eric Rouchaud, has developed since 2009 an ambitious project to strengthen the appreciation and love for music through personal contact and the forging of relationships between the artists and the audience. It is based on a continuous and renewed artistic presence, on artistic collaborations, and on policies supporting artists, especially those of the younger generation. It hosts a wide variety of musical and lyrical projects from baroque to the present (including operas, recitals, chamber and symphonic music, choirs). It grants a significant and major place to the voice, as well as to choreographies, musicals, and other multidisciplinary shows. In 2014, the Imperial Theatre of Compiègne acquired a new Concert Grand Steinway. This is the piano Edna Stern plays in this recording.